After spending a week away and eating out more than I should, I needed to cook something healthy when I got home. Thankfully I read an article while I was away on one of my favorite food blogs Tasting Table about this Japanese sauce used for grilled meats (Yakitori) called Tare Sauce. I thought this sweet and thick soy sauce would be a perfect match for grilled fish. I found a great looking piece of Sea Bass at the grocery store and a new recipe was born! Now sit back, grab a good glass of Sake, and enjoy this recipe for Big Green Egg Japanese Sea Bass. To make the Tare sauce you need Soy Sauce, Mirin, Sake, Rice Wine Vinegar, Brown Sugar, Green Onions, Ginger and Garlic. Let the mixture reduce down until thickened and strain the bits and pieces out to get a thick sauce. I rubbed the Sea Bass with EVO and salt then grilled (raised direct) skin side down with the dome measuring 400°. After 10 minutes or so the fish starts to brown and is ready to come off. 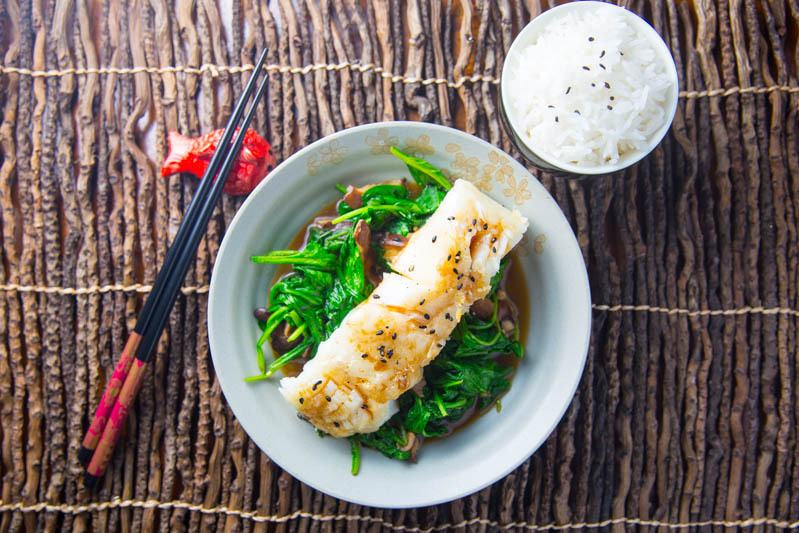 I sliced the Sea Bass and served over wilted spinach and sautéed Shiitake Mushrooms with a side of white rice. Delicious! This recipe for Grilled Japanese Sea Bass is delicious. The perfect healthy alternative for your next time on the grill. In a saucepan over medium heat, add all of the ingredients and whisk together until smooth. Bring to a boil, then reduce heat to a simmer and cook until the sauce has reduced by half and thickened enough to coat the back of a spoon evenly, 15 to 20 minutes. I want to teach you how to master the art of Grilling by Feel. No matter what grill you are working with, being able to use your 5 senses will produce great results every time. Follow me on the path to BBQ greatness! Grill a perfect steak every time!